These are images I created (unless otherwise noted) to illustrate the actual size of some Vegas structures by placing them in famous locations or visa-versa. The measurements are as close as possible. This is also a great way to show off my Photoshop skills...enjoy. If you can think of a comparison you'd like to see, write me. The lake in front of the Bellagio is 985 feet long (.19 miles for you walkers). 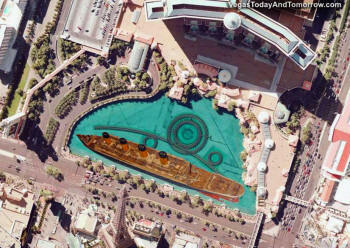 The Titanic was 882.7 feet long and would fit nicely (if it had a flat bottom) into the shallow lake. Photo work by Vince Yarga. Click image to enlarge. This is another obvious comparison in which Vegas loses by 49%. The real Eiffel Tower is 1,069 feet and the one in Vegas is only 540'. I threw the Stratosphere in here as well since it's roof is only 58' below the Eiffel Towers roof (antennas and rides not included). The original Eiffel Tower was built in 1889 and is made of wrought iron pieces which are fastened together with 2,500,000 rivets. The one in Vegas is made from welded steel and is stronger structurally, and has "false rivets" to duplicate the look of the original. This image was a bear to work with, due to the open lattice of the tower. I thought I'd do this one as it was destined to be an obvious request and it makes a pretty picture. The Great Pyramid is 482' and the Luxor is 350'. Aw shucks! Giza wins. Keep in mind that each window in the Bellagio is really two floors high and covers four rooms. It's an architecture trick to minimize the look of the building. The Bellagio is 515' tall and Rushmore is 530'. I couldn't resist this size comparison. That's the real Statue of Liberty next to the scaled down one in Vegas. 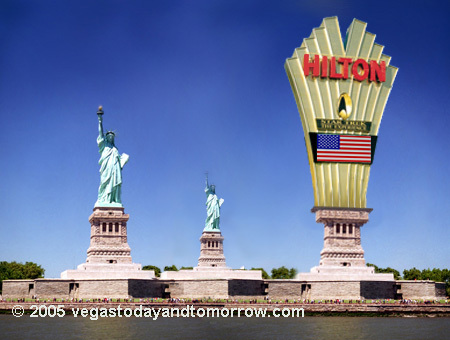 The real statue (from the top of the base to the flame) is 151' the Hilton sign is 279'. It's no wonder Al Qaeda hates us. I had to beef up the base to compensate for the width of the sign. Wynn Washington? 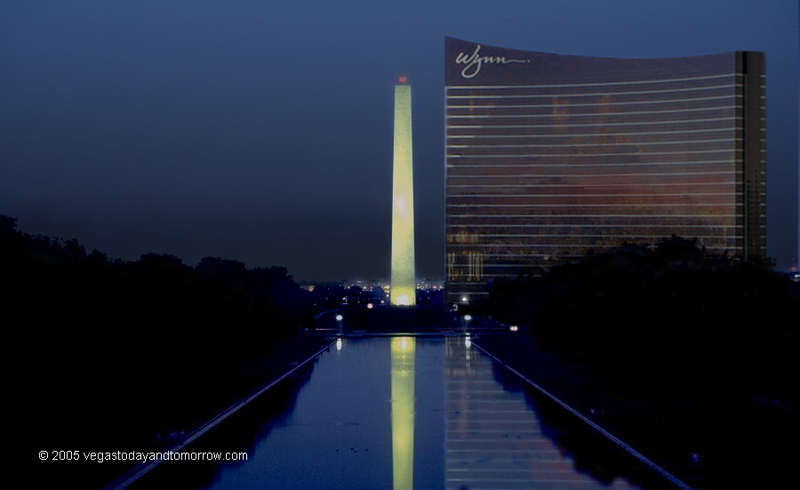 Ok, so this is not a real dream, it's actually just a size comparison study (monument 555' Wynn 614') and an excuse to show off my Photoshop prowess. Notice the concave reflection of the Lincoln Memorial in the building. Also in the buildings reflection, the sunset is painted in and the Vegas buildings and mountains were painted out. The Washington sky behind the building was darkened in a gradient to better emulate the false twilight. The Steve might get a kick out of this one.